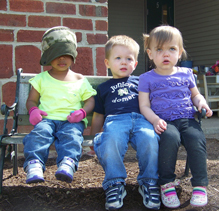 Toddler - Peace Montessori School |Toddler, Preschool, Kindergarten, Elementary & Middle school programs in Fort Wayne, IN. The importance of the period from birth to three years old cannot be underestimated, for this is the formative period for personality, trust, thinking, problem solving and independence. All materials are selected with an emphasis on exploration and experimentation. Becoming independent is the basis of the toddler curriculum. Teachers spend much of their time helping toddlers learn to dress and feed themselves as well as manage their own toileting. Successful independence is at the core of a child’s self-esteem. The Toddler curriculum also incorporates the development of practical life skills, such as washing hands and dishes, food preparation, setting the table, and putting activities away. It is important that toddlers practice little tasks to develop independence, coordination, concentration and a sense of order. Routine and repetition help a younger child feel safe and secure. In addition, children at this age work on the development of language skills. Emphasis is placed on developing conversational language with the ability to tell a story, listen and retell a story, thus laying the groundwork for reading and writing skills in the Primary 3-6 Program. Toddlers are also introduced to the use of a library. They visit our on-campus library for storytelling. Finally, sensorial skill instruction is found in the toddler classroom. The five senses – sight, touch, sound, taste and smell – are engaged in such activities as food tasting, dancing and painting, developing a child’s visual, tactile and auditory discrimination. Spanish and Music presentations round out the weekly curriculum in addition to plenty of outdoor fun and exploration on our 11-acre campus.